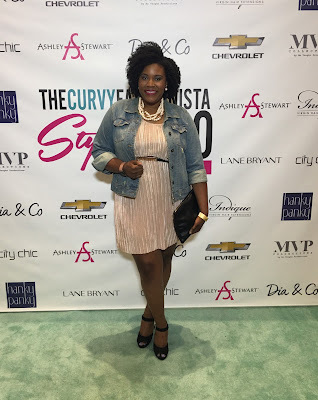 Picture it: Atlanta, 20-17, a two day conference filled with awesome panels, fabulous fashion shows, shopping galore, beautiful plus size bloggers, fine big and tall men, and a whole bunch of #blackgirlmagic and so much more. Can you see it? 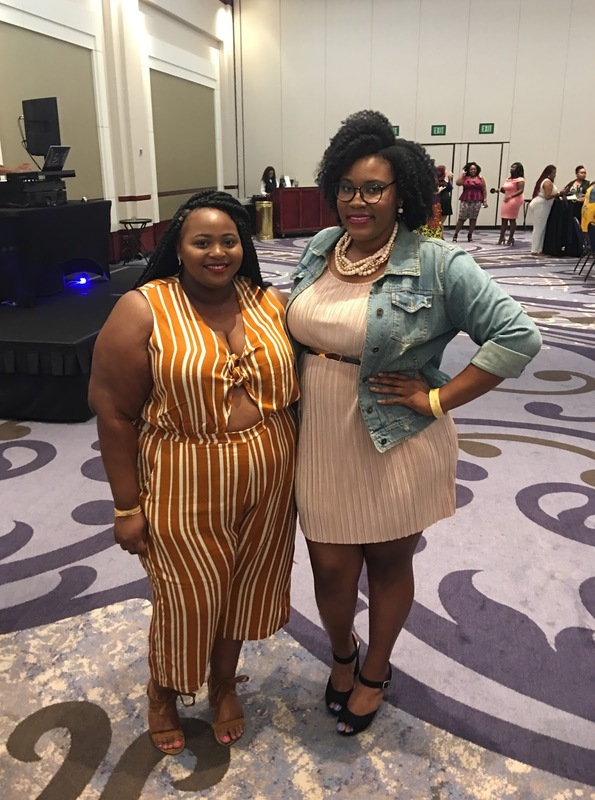 Well if you can’t then you probably missed out on one of the greatest plus size events to hit the south this summer, the TCF Style Expo 2017! Day 1 started off with me fighting to get out of bed at 7:00am (LOL) but once up and beautified I headed to the Blogger Brunch where Natasha Eubanks of The YBF Daily dropped some jewels during her interview with Marie Denee about her blog and how she got started. After brunch I headed over to the Style Has No Age or Size panel where Darlene of Suits, Heels and Curves, ShaKera of The Real Sample Size, Jeniese of The Jenesaisquoi and Alison of Wardrobe Oxygen shared knowledge on how their age doesn’t mean they can’t slay. Next, it was time to hit the vendors and see what I could spend my coins on. While spending coins, I enjoyed performances by Ashlee Haze and Terrell Mercer, both spoken word artist. After the amazing performances, those fine big and tall men rocked the runway for the MVP Collection Fashion Show and lets just say that if I could have left with a bae, I would have (CHILEEEE). Once the show was over I stopped by The Plus Strut table, which I am a brand ambassador for, to spend a little time getting my plus size beauties to sign up for the first plus size 5k EVER. Then after a quick run home and change of clothes I ended the night catching up with my blogger boos, new and old, at the Networking Mixer presented by Ashley Stewart. Then it was home to get prepare for day two. The homie Dals of 6FeetofFashion. A blogger is a photographer as well. This girl right here is my new blogger bestie! We jsut get each other. Doesn't Eclectic Kurves look AMAZING! Getting up for day to was less of a struggle because I decided to sleep in and missed out on VIP Brunch Presented by DIA & Co. I hate that I missed it but listen if I don’t get a decent amount of sleep I become an angry 2 year old. Once I did get fine and I arrived just in time to catch the "Big Impact Beyond the Runway" panel with Monica D. Day, De’Shundra Gibson and MsNikee Mack. Soon after I made my way to the main stage for the Finding Ashley Pageant presented by Ashely Stewart where two lucky ladies won the chance to compete in the finals to be Ms. Ashley Stewart. I ended up sneaking out of pageant a little early because I had to get a seat at the next panel, "The Styled for Life" panel with Maui of Phat Girl Fresh and Shaina of Corner Rich and let me tell you it was AMAZING! Once the panel ended I made my way back to main stage just right on time to see Pretty Big Movement dance their behinds off! It was EVERYTHING! As it was just about time for me head out, I had to pop my head into one last event, the Model Workshop lead by Telethia Penn. Now I didn’t get to stay long but I can tell that she was going to give the 411 on becoming the best model you can be. All in all the weekend was amazing, I spent way to much money, I walked over 30,000 steps and I can’t wait to do it all again next year. When you run into old friends at events! Hey Endia! If you missed out this year be sure that you are in the building next year because you literally cannot afford to miss this event two years in a row. Until next year though, be sure to check out the hashtag on Instagram, #TCFStyleExpo and browse some of your favorite blogger’s blog for their pictures and recaps as well. A few of mine are listed below.